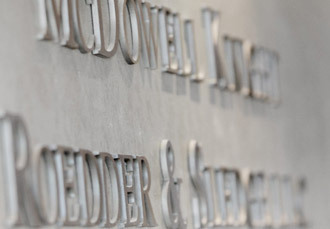 McDowell Knight Roedder & Sledge, LLC represents Fortune 500 companies and other international, national, state and local entities in all types of litigation and appellate work in Alabama and throughout the Southeast. Although litigation is our primary focus, we regularly represent clients in business and transactional matters, including real estate, finance and probate. Our firm’s unyielding commitment to hard work and superior legal representation has made it one of the more dynamic and soundly reliable firms in the State of Alabama. The firm is engaged in all major fields of law, including admiralty, antitrust, banking, bankruptcy, business, class actions, communications, construction, consumer transactions, D&O liability, drug and device liability, employment, environmental, fraud, insurance, oil and gas, pharmaceutical liability, product liability, professional malpractice, railroad liability, real estate, securities, shareholder relations and trust disputes. In addition, our attorneys regularly advise clients on employment issues and business matters, including matters involving allegations of white collar crime. In today’s ever-changing business and legal climate, McDowell Knight is prepared to meet new challenges and provide legal services to ensure that its clients are represented in the most effective manner. We approach every legal matter as part of a relationship that will continue for many years, built upon quality representation and trust. We enjoy doing challenging legal work, no matter how demanding. Our attorneys strive to obtain the best result possible for our clients. At the end of the day, our job satisfaction depends on our client’s satisfaction with our work. McDowell Knight encourages the involvement of our lawyers in professional activities. As a result, our lawyers are leaders in the legal community and are actively involved in some of the country’s most prominent legal organizations. Many serve in key leadership positions in nationally renowned organizations such as the American Bar Association, American Board of Trial Advocacy, Federation of Defense and Corporate Counsel, International Academy of Trial Lawyers, International Association of Defense Counsel, Product Liability Advisory Counsel, Defense Research Institute, Maritime Law Association, National Association of Railroad Trial Counsel and the Southeastern Admiralty Law Institute. Three of our members are Fellows in the prestigious American College of Trial Lawyers. Another was the Chairman of the Board of Directors of the 14,000 member Federation of Defense and Corporate Counsel, having served as its President during 2002. That same lawyer was also Chairman of the Board of Directors of the Defense Research Institute, an organization of 22,000 attorneys representing businesses and insurance companies. Other members are listed among nationally recognized lawyers in Best Lawyers in America and Super Lawyers. Finally, our members include past presidents of the Mobile County Bar Association. Read more about our community involvement. Through our work ethic and intellectual curiosity, we strive to continually improve our legal skills. In a rapidly changing legal environment where advances in technology have accelerated the development of the law, we stay abreast of the latest trends. Our lawyers work on cases at the forefront of those changes and also write and speak on these topics. McDowell Knight lawyers regularly give presentations at seminars throughout the United States and are published in national law reviews and other legal publications. In addition, Martindale Hubbell, which has published lawyer rankings for more than 100 years, has given the firm its very highest ranking. This ranking reflects the professional standards and abilities of our firm as judged by both lawyers and jurists. Finally, our lawyers are active in leadership positions in numerous civic, charitable, religious and social activities, providing support to the larger community. The attorneys and staff at McDowell Knight Roedder & Sledge, LLC are proud to be a part of the growth and heritage of south Alabama.